When Douglas Mawson planned his Australasian Antarctic Expedition (1911¨C14) he took advantage of newly available technology. His proposal to use an aeroplane for reconnaissance of unexplored regions in Antarctica was an innovative strategy, a first in polar exploration. He ordered a French©\designed Robert Esnault©\Pelterie (REP) two©\seater monoplane from Vickers Ltd in England. When a test flight in Adelaide ended in a crash, Mawson was forced to revise his plans. He took the engine and fuselage south to use as a motorized sledge or ¡°air©\tractor¡±. 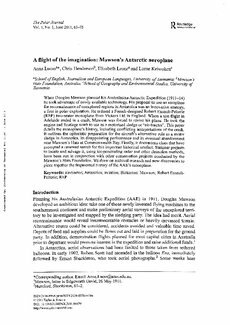 This paper details the monoplane¡¯s history, including conflicting interpretations of the crash. It outlines the optimistic preparation for the aircraft¡¯s alternative role as a motor sledge in Antarctica, its disappointing performance and its eventual abandonment near Mawson¡¯s Huts at Commonwealth Bay. Finally, it documents clues that have prompted a renewed search for this important historical artefact. Summer projects to locate and salvage it, using ice©\penetrating radar and other detection methods, have been run in conjunction with other conservation projects conducted by the Mawson¡¯s Huts Foundation. We draw on archival research and new discoveries to piece together the fragmented history of the AAE¡¯s monoplane.